If you have a few hours to spare and would like to get involved in looking after the rivers, streams and canal in the Kennet catchment there are several ways you can join in. Run regular volunteering sessions in and by the river, these are on Wednesday afternoons, with regular weekend sessions and monthly Friday afternoon tasks too. Tasks can be in the Marlborough area and beyond, with regular tasks at Kintbury, Ramsbury and a new project starting this month in Hungerford. Activities include riverbank restoration, planting, in-stream habitat improvements and maintenance, and litter picking. Whether you want to become a volunteer lock keeper, help wildlife, learn more about canal heritage or take on more of an office-based role, there’s bound to be an opportunity at the Canal & River Trust to suit you. As one of the newest charities in England and Wales, we’re holding a huge volunteer campaign to help us meet our important aims. There’s never been a better time to get involved! 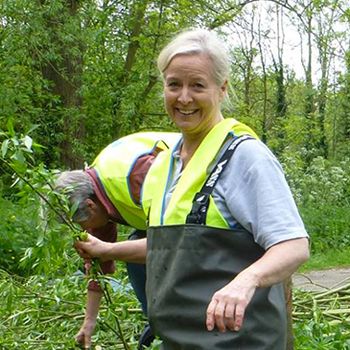 We need volunteers to continue our vital work along the 87 mile Kennet & Avon. We are entering a new phase of restoration, embarking on an ambitious programme of works valued at around £5m, and more volunteers would help us achieve that goal. We have a group of volunteers, (the Pang Valley Conservation Group), who provide practical work for the WBCS and also support the conservation work of West Berkshire Council and the local Parish Councils. The Heritage Lottery funded ‘RENEWAL’ (Restoration in Newbury Along the river Lambourn) Community Project is now underway with lots of exciting events and activities planned for the river Lambourn in Newbury over the next three years.